In summer sunscreen cream is an essential product for our skin. Without applying sunscreen cream we never go outside in summer. If you do so u can protect your skin. One of the most essential skincare product in our skincare range. 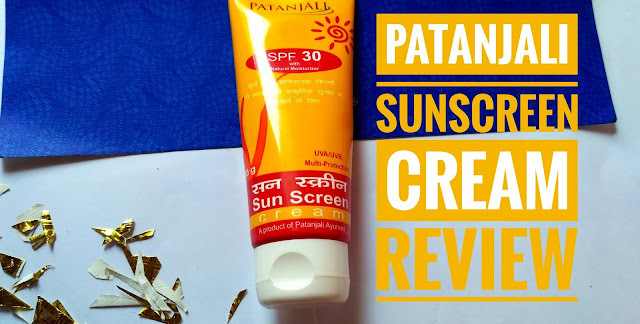 Today I came up a review about very affordable and chemical free sunscreen which is Patanjali sunscreen cream. The Patanjali sunscreen cream comes in a yellow plastic tube with a white flip cap. The cap shuts tightly to make sure there is no product leakage. I liked its packaging, it's sturdy, convenient to use and travel-friendly packaging. The Patanjali sunscreen cream comes in a milky white color and has a creamy texture. It has a herbal mix fragrance. ➨I liked its sturdy and travel-friendly packaging. ➨Has SPF30, UVA/UVB multi protection formula. ➨Herbal product and free from harsh chemicals. ➨It leaves a little bit white cast. ➨Not suitable for oily skin. Sunscreen cream made from the natural oils and extracts which protects the skin from harmful sun rays, nourish and revitalize the complexion to make skin fresh, smooth and beautiful. After cleansing, toning my face, I take a generous amount of this sunscreen cream and apply it all over my face and neck. It spreads easily and gets completely absorbed the skin with a little massage. It is very moisturizing and there is no need to apply moisturizer. It also leaves a little bit white cast on my skin. One of the affordable sunscreen in India which is free from harmful chemicals.